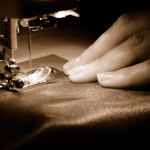 Whether you are just learning to sew or have already gained many years of experience in sewing, a sewing machine is a useful investment for all craftspeople looking to learn how to perform this certain skill. One sewing machine stands out from the rest of the market for its various merits and for its design that is both highly versatile and easy to use no matter how much experience you have with a sewing machine. This device is known as the Brother Innovis 2800, one of the many types of sewing machines under the Brother line of sewing machines. What Is the Brother Innovis 2800 Sewing Machine? The Brother Innovis 2800 is a sewing machine that contains over 100 embroidery designs based on characters and designs associated with Walt Disney movies. Its main feature is a large color LCD screen that helps users of the machine navigate through the various options for sewing, embroidery stitches, and design. The screen also displays tutorials and walkthroughs for guiding beginners through their attempts to navigate the world of sewing. You can also connect the Brother Innovis 2800 machine to certain computers via a USB port. The Brother Innovis 2800 Sewing Machine has an enormous number of features. There are over 700 options for utility, decorative, and quilt-stitching options. There are over 120 designs based on Walt Disney characters, 340 on board embroidery designs, and the stitch width and length are adjustable. You can also use the screen of the Brother Innovis 2800 to edit your work, and rotate your embroidery in one, ten, or 90-degree increments at a time. It has a long, proud reputation for being user friendly, in the same vein as the other sewing machines sold by the Brother line, which is renowned for its easy-to-understand user manuals. The Brother Innovis 2800 can be fairly difficult to find online nowadays, but it can occasionally be found from online retailers such as Amazon, depending on the condition of the machine. However, you will probably have better luck finding other products from the Brother line than the Brother Innovis 2800, with the Amazon options skewing towards their newer machines. The Brother Innovis 2800 can go for a surprisingly high price thanks to the fact that it is fairly difficult to find nowadays, and the many features of the product can make it highly valued among people familiar with what makes up a good sewing machine. Enormous variety of options in terms of patterns, stitches, etc. The Brother Innovis 2800 is renowned for its ease of use, featuring tutorials, a computer screen that makes the functions simple and easy to select, and possessing a wide variety of different techniques for the potential user to take advantage of. The above rating is something of a bet hedging due to the wide variety of prices that a Brother Innovis 2800 Sewing Machine can go for. If you can find one for within your price range, you should definitely leap at the chance to use it and take advantage of its many features, regardless of your level of experience in the field of sewing. The design of the Brother Innovis 2800 is easy to use and features some of the most convenience of any sewing machine. It only needs to be serviced by a sewing machine repair professional about once each year, and it almost never needs to be lubricated. It also can be used for a huge variety of fabrics: natural fibers such as cotton, linen, or wool are the best option, but fine fabrics (velvet, silk, satin, and taffetta), knits, synthetic fabrics (blends, polyester, rayon), denim, and upholstery can all be used by this particular sewing machine with ease. Because the manufacturer has moved onto other products, finding a warranty for a Brother Innovis 2800 may depend on the seller, or may not exist at all. The SINGER Start 1234 Portable Sewing Machine with 6 Built-in Stitches is designed to be a beginner's sewing machine that executes simple tasks with minimal problems. It is noted for its toughness and ability to sew up jeans and leather, but it is not recommended as a product designed to tackle multiple layers of fabric. It also comes with decorative vinyl stickers to attract younger, less experienced consumers into customizing their very own sewing machine and making it their own. 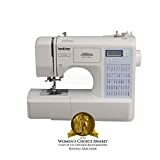 As a sewing machine designed to be used by beginners to accomplish simple tasks, the SINGER has no frills and is straightforward to work with. 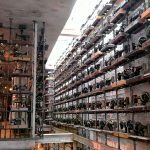 However, more experienced sewers may be frustrated by the machine's inability to take on more difficult tasks, which bumps down the ease of use for the more ambitious. The value of the SINGER sewing machine is terrific if you know what you are getting, with a used or new sewing machine ranking among the cheaper purchases on the market and providing exactly what you need if you are a beginner. The stickers are a nice bonus to add some personality. The Singer is well designed for what it is, a beginner's sewing machine. It is portable, easy to use, and it only takes one easy step to select the stitch of your choice. However, it can be a little too basic for the more advanced user. The warranty for the SINGER is terrific, offering replacement parts and repair free from one year of purchase while also promising that the machine will endure up to 25 years, offering free replacement parts (but not repair and labor costs) during that entire time period assuming wear and tear are not the source of the problem. The Brother Project Runway CS5055PRW Electri​​c Sewing Machine is a machine that is designed to be easy to set up and use, with many efficient features including 50 built in stitches. Each of these 50 built in stitches comes with multiple stitch function, giving users plenty of control over their own projects while also being easy to use. Most users agree that the Brother Project Runway machine is easy to use and features a well structured manual that ought to ensure both beginners and more advanced sewers can use the machine and enjoy it. As a fairly inexpensive sewing machine that performs its functions efficiently, with the ability to work with stubborn fabrics thrown in, the Brother Project Runaway offers great value for money. The main complaint involving the Brother Project Runway is that it features too much plastic in the design, which can make it more suspectible to wear and tear. However, it is otherwise well-constructed, with a heavy duty motor that is less noisy than average. The warranty for the Brother Project Runway only covers one year from the date of purchase for the machine itself, with accessories getting about 90 days. The Brother Jx2517 Lightweight and Full Size Sewing Machine is a portable and inexpensive sewing machine designed to be primarily used by beginners. It became a hit in the sewing world thanks to its convenience and ability to appeal to beginners. This star rating is a hedging of bets as the value for money of a Brother Lightweight is subjective. 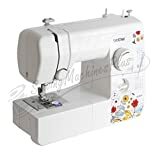 If you are a beginner or need a portable sewing machine, then you will probably get more out of it than an experienced sewer who primarily works from home. The Brother Lightweight is tough for a basic sewing machine, and it can use 17 built in stitches, which is far more than the usual. However, it is somewhat limited for the sake of appealing to starter users. The Brother Lightweight's warranty may vary depending on the seller, as it goes on Amazon from third party sellers. After looking through four different brands of sewing machines, the verdict comes down to what your skill set is and how much you can afford. Those looking for a beginner's sewing machine are encouraged to purchase the Brother Innovis 2800 or Lightweight over the SINGER, with the variety of features on Brother's machines making them ideal for beginners, along with their tough design quality. The only potential is finding good versions of them online that are covered by warranty. For a more advanced user, the Brother Project Runway is probably the way to go, with a variety of features and toughness that make it convenient for the average user. However, those looking into a sewing machine purchase are advised to take an honest look at what their sewing level is before making a commitment to one particular brand of a sewing machine. 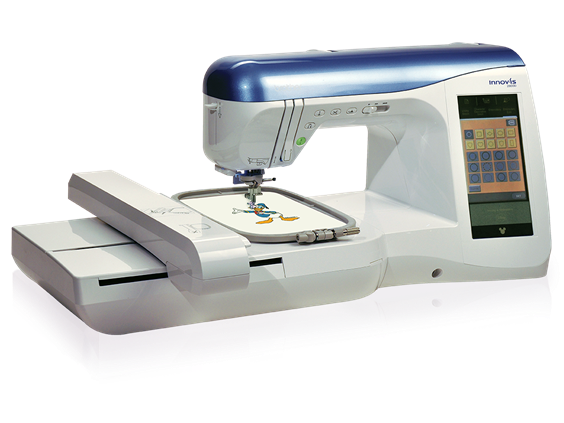 The Brother Innov-is 2800D Embroidery Machine is an extremely versatile unit that is great for beginners. It offers plenty of options when it comes to patterns and stitches, and it also features a large color LCD screen. However, this unit is already discontinued by the company.